Product #20609 | SKU 3I-20117SLR2 | 0.0 (no ratings yet) Thanks for your rating! The black iSeries 2011-7 Two DSLR with Lenses Case from SKB fits up to two DSLR bodies with 24-70mm f/2.8 and 70-200mm f/2.8 lenses attached, along with a flash, and accessories such as lens hoods, batteries, and memory cards between custom-cut foam slots inside the case. This case is ideal for wedding and event photographers and is designed with removable blocks so that it can accommodate camera bodies with or without battery grips. The custom waterproof case has trigger release latches for quick, but secure access, and is made in the USA. For easily transporting the case, there are wheels and a pull out trolley handle. 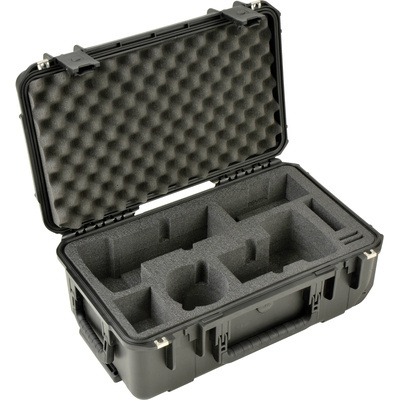 This iSeries injection moulded waterproof case is constructed of ultra high-strength polypropylene copolymer resin, features a gasket, and has a waterproof, submersible design (IP67) that is resistant to corrosion and impact damage. Its continuous moulded-in hinge, patented "trigger release" latch system, comfortable, snap-down rubber over-moulded cushion grip handle, secure stacking, and automatic ambient pressure equalisation valve (MIL-STD-648C) all contribute to its military grade design.